This velocity map was created by co-registering two ASTER images to sub-pixel accuracy and then feature tracking on them using Cosi-Corr. The debris-covered surface allows the feature tracking algorithm to correlate surface displacement effectively, however, matches are sparser in the clean-ice areas (e.g. the Khumbu Icefall) where glacier velocity is high but there are fewer surface features. This post contains a list of recent studies relating to debris-covered glaciers, primarily in the Himalaya. The main conclusions detailed in the abstract are also listed. The list is a work in progress but please get in touch if you would like a study added. 3. Kraaijenbrink et al. 2016. Object-based analysis of unmanned aerial vehicle imagery to map and characterise surface features on a debris-covered glacier. Remote Sensing of Environment. 186, 581-595. 4. Brun et al. 2016. Quantifying volume loss from ice cliffs on debris-covered glaciers using high-resolution terrestrial and aerial photogrammetry. Journal of Glaciology. 1-12. 5. Buri et al. 2016. A grid-based model of backwasting of supraglacial ice cliffs on debris-covered glaciers. Annals of Glaciology 57(71), 199-211. 6. Steiner et al. 2015. Modelling ice-cliff backwasting on a debris-covered glacier in the Nepalese Himalaya. Journal of Glaciology. 61(229), 889-907.
a. Analysed 172 Landsat TM/ETM+ scenes (1999–2013) to identify thawed supraglacial ponds for five debris-covered glaciers in the Langtang Valley of Nepal. b. The ponds showed pronounced seasonality, appearing in the pre-monsoon as snow melts, peaking at the monsoon onset, then declining in the post-monsoon as ponds drain or freeze. c. Ponds were highly recurrent and persistent, with 40.5% of pond locations occurring for multiple years. 2. Mertes et al. 2016. A conceptual model of supraglacial lake formation on debris-covered glaciers based on GPR facies analysis. Earth Surface Processes and Landforms. 3. Watson et al. 2016. The dynamics of supraglacial ponds in the Everest region, central Himalaya. Global and Planetary Change. 142, 14-27. 4. Miles et al. 2016. Refined energy-balance modelling of a supraglacial pond, Langtang Khola, Nepal. Annals of Glaciology. 57(71), 29-40.
b. The pond acts as a significant recipient of energy for the glacier system, and actively participates in the glacier’s hydrologic system during the monsoon. 5. Thakuri et al. 2016. Factors controlling the accelerated expansion of Imja Lake, Mount Everest region, Nepal. Annals of Glaciology. 57(71), 245-257. 1. Ragettli et al. 2016. Heterogeneous glacier thinning patterns over the last 40 years in Langtang Himal, Nepal. The Cryosphere, 10, 2075-2097.
a. DEM differencing using stereo satellite imagery from the period 1974-2015.
b. 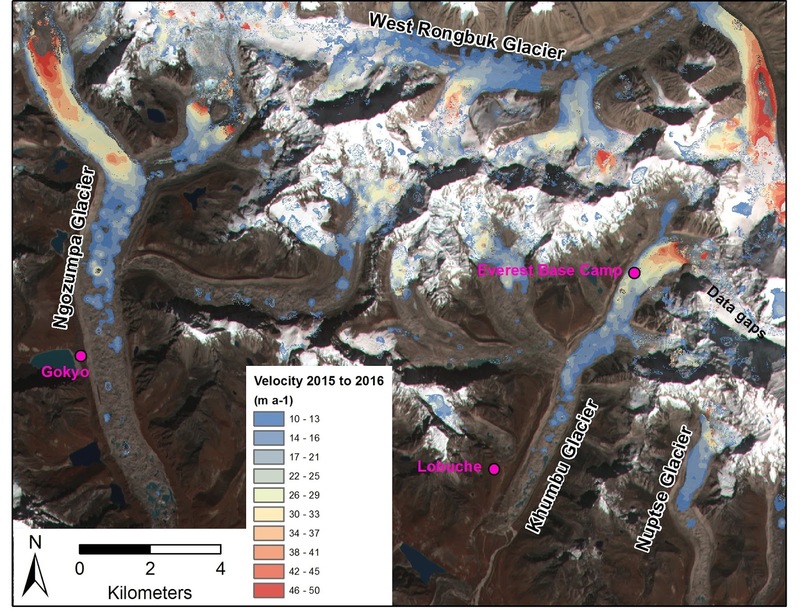 Accelerated glacier thinning between 2006 and 2015 when compared to the period 1974-2006.
c. The April 2015 earthquake has a clear impact on glaciers of the area, with avalanche deposits compensating for 40% of 1-year average mass loss. 2. Thompson et al. 2016. Stagnation and mass loss on a Himalayan debris-covered glacier: processes, patterns and rates. Journal of Glaciology. 1-19. 3. Vincent et al. 2016. Reduced melt on debris-covered glaciers: investigations from Changri Nup Glacier, Nepal. The Cryosphere. 10(4), 1845-1858. 4. Kääb et al. 2015. Brief Communication: Contending estimates of 2003–2008 glacier mass balance over the Pamir–Karakoram–Himalaya, The Cryosphere, 9, 557-564, doi:10.5194/tc-9-557-2015. c. Mass loss of −24 ± 2 Gt yr−1 in the Ganges, Indus and Brahmaputra basins- about 10% of current glacier contribution to sea level rise. 5. Lama et al. 2015. Glacier area and volume changes of Hidden Valley, Mustang, Nepal from ~1980s to 2010 based on remote sensing. Proc. IAHS. 368, 57-62.
b. Average estimated glacier ice reserves lost is 0.326 km3 (26.26 %) and the total glacier area loss is 4.33 km2 (21.87 %) from the 1980s to 2010 based on manual delineation. 6. Pellicciotti et al. 2015. Mass-balance changes of the debris-covered glaciers in the Langtang Himal, Nepal, from 1974 to 1999. Journal of Glaciology. 61(226), 373-386. 7. Neckel et al. 2014. Glacier mass changes on the Tibetan Plateau 2003–2009 derived from ICESat laser altimetry measurements. Environmental Research Letters, (9). a. Ice surface elevation change between 2003 and 2009 using ICESat satellite altimetry data over the Tibetan Plateau. b. Total annual mass budget of −15.6 ± 10.1 Gt yr−1 estimated for eight sub-regions across the Tibetan Plateau. c. −13.9 ± 8.9 Gt yr−1 of the total mass budget contributed directly to global sea level rise. 1. Rounce et al. 2016. A new remote hazard and risk assessment framework for glacial lakes in the Nepal Himalaya. Hydrol. Earth Syst. Sci. 20(9), 3455-3475. 2. Watson et al. 2015. An improved method to represent DEM uncertainty in glacial lake outburst flood propagation using stochastic simulations. Journal of Hydrology. 529, Part 3, 1373-1389. 3. Westoby et al. 2015. Numerical modelling of glacial lake outburst floods using physically based dam-breach models. Earth Surf. Dynam. 3(1), 171-199. 1. Ragettli et al. 2015. Unraveling the hydrology of a Himalayan catchment through integration of high resolution in-situ data and remote sensing with an advanced simulation model. Advances in Water Resources. 1. Kraaijenbrink et al. 2016. Seasonal surface velocities of a Himalayan glacier derived by automated correlation of unmanned aerial vehicle imagery. Annals of Glaciology. 57(71), 103-113. 1. Soncini et al. 2016. Future hydrological regimes and glacier cover in the Everest region: The case study of the upper Dudh Koshi basin. Science of The Total Environment. 565, 1084-1101. 2. Chand et al. 2015. Seasonal variation of ice melting on varying layers of debris of Lirung Glacier, Langtang Valley, Nepal. Proc. IAHS. 368, 21-26.
a. Seasonal melting of ice beneath different thicknesses of debris on Lirung Glacier in Langtang Valley, Nepal, was studied 2013–14. b. The melting rates of ice under 5 cm debris thickness are 3.52, 0.09, and 0.85 cm d-1 during the monsoon, winter and pre-monsoon season, respectively. c. Maximum melting is observed in dirty ice (0.3 cm debris thickness) and the rate decreases with the increase of debris thickness. d. The energy balance calculations on dirty ice and at 40 cm debris thickness show that the main energy source of ablation is net radiation. 3. Parajuli et al. 2015. Modified temperature index model for estimating the melt water discharge from debris-covered Lirung Glacier, Nepal. Proc. IAHS. 368, 409-414.
a. This paper presents a glacier melt model developed for the Lirung sub-basin of Langtang valley. b. Used a temperature index approach to estimate sub-daily melt water discharge for a two week period at the end of monsoon, and the melt factor is varied according to the aspect and distributed to each grid processed from the digital elevation model. c. The model uses easily available data and simple extrapolation techniques capable of generating melt with limited data. 4. Rowan et al. 2015. Modelling the feedbacks between mass balance, ice flow and debris transport to predict the response to climate change of debris-covered glaciers in the Himalaya. Earth and Planetary Science Letters. 430, 427-438.
d. Predict a decrease in Khumbu Glacier volume of 8–10% by AD2100, accompanied by dynamic and physical detachment of the debris-covered tongue from the active glacier within the next 150yr. 5. Rounce et al. 2015. Debris-covered glacier energy balance model for Imja–Lhotse Shar Glacier in the Everest region of Nepal. The Cryosphere. 9(6), 2295-2310. 6. Shea et al. 2015. Modelling glacier change in the Everest region, Nepal Himalaya. The Cryosphere. 9(3), 1105-1128. 1. Viste et al. 2015. Snowfall in the Himalayas: an uncertain future from a little-known past. The Cryosphere. 9(3), 1147-1167.